The View from Aristeia: Save money! Expand your library! Win my bits! Would you mind terribly whispering to your mole that, to a newcomer, this promotion is rather confusing? @Standback: I've forwarded your comment to the mole, and either the mole will respond directly, or I'll paraphrase what I find out. I apologize for the confusion. The banner ad says use promo code cplusplus at checkout. 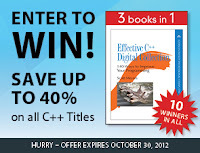 correct - the discount code to enter during check out is CPLUSPLUS (note it is case sensitive).